It will be a reduction of 17% to 62.5% in our usual donation request depending on what educational materials you choose. In addition, in the case of the hard copy of our DVD, we are also offering a reduction in the shipping fee! This will especially be of value to those who live internationally! Green Pasture Products has offered to support this opportunity! If one donates $50.00 to Nourishing Our Children with this promotion, Green Pasture Products will email the individual a $10.00 coupon. A $75.00 donation will result in a $15.00 coupon and $100.00 donation in a $20.00 coupon! Order their Fermented Cod Liver Oil, High Vitamin Butter Oil, Skate Oil and other items we recommend, for less! The coupon will have an expiration date of September 30, 2012. The opportunity has been extended to September 10, 2012 at 6:00P PST. Do you have our educational materials? Would you support us with a review in the comments? WOW! The Nourishing Our Children DVD is SIMPLY AMAZING! As a nutrition educator and natural chef, I know quite a bit about this nutritional path, but can honestly say that I learned so much more. The information included is very thorough but given in a way that anyone at any level can understand and make sense of it. I also love how many resources are given within to help people find their own path with this way of life and really make it their own. The visuals are beautiful and the animations captivating, and I never felt that I was watching a nutrition video. Kudos to Sandrine and her steadfast dedication and commitment to The Nourishing Our Children Campaign and The Weston A. Price Foundation. This information is so vital to the work that I do and I feel confident in this new tool to help spread the word of healing to all!!!!!! Thank you for your words of support and encouragement, Angie! It means a lot to me. There is nothing “out there” for children’s nutrition information that comes close to matching the content and presentation in Nourishing Our Children. It moves hearts and minds, and moreover easy on the eyes. That must be why it’s the “Go-To” educational resource for the Weston A. Price Foundation Leaders and the communities they serve. Imagine if this was required viewing for pre-school, head-start programs. And, a must-have wedding or baby shower gift. The heartaches this DVD will prevent, boggle the mind. Thank you for the gift of your support, Cathy! This DVD is a must have for all parents of young children and all people intending to have children. Not only is it packed with crucial and essential information that is not readily available elsewhere, it is beautifully designed and presented. I wish I had seen it when I was pregnant. Thank you, Julie! Lovely to read. This is such a great opportunity to get the educational materials “On Sale!” Even at the regular donation the information provided is priceless because of all the benefits it can bring to your family. I like to give this for baby shower or 1st birthday gifts. I recommend before a baby is even concieved! For a marriage gift! I think we say wedding gift, actually! After viewing nearly the entire Nourishing Our Children DVD, I feel compelled to say that this is truly a work of art. It kept me engaged and interested throughout, despite the fact that I have seen and reviewed the PowerPoint presentation many times. This DVD contains an abundance of invaluable information that is presented with beautiful photographs and in a way that is easy to understand regardless of your level of knowledge in nutrition. Although it’s called Nourishing Our Children, I’d say it’s a must-have for everyone, not only parents. Bravo to Sandrine Hahn and NOC! Amazing work! Riki, as someone engaged in visual communication, “truly a work of art” is very rewarding to read. Thank you! 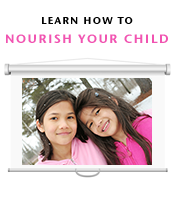 The Nourishing Our Children DVD is so compelling and thought-provoking! It’s filled with interesting research and vital information that I wish I had learned before I had my son. We now implement as many of these principles into our lives as possible! Thank you, Karen! Your testimonial is the reason we hope to reach parents before they conceive – so they won’t wish they had the information after the fact! So delighted to read that our materials are of value in your practice! These materials are not only educational but insightful. The information presented is easy to understand, yet for most, this is new information that is critical to raising a healthy child. As a Nutritionist, I highly recommend the materials to my clients with children and and those wanting to conceive. Sandrine has done a wonderful job putting this DVD together with colorful pictures and stories. It will make you question not only how you feed your child but how our current diet is affecting us all. Thank you for this supportive testimonial, Carla! Should We Avoid Fish Because of Mercury?